Thumbtack is a service that connects prospective customers (individuals & businesses) with professionals who are screened and provide services in demand. Thumbtack offers a diverse range of service types – from home services to the types of services Creative by Clark performs: website design & development, graphic design, etc. Thumbtack’s “technology is transforming the way people accomplish any project, anywhere, anytime*.” Prospective customers interested in a having project completed submit their requirements online and Thumbtack sends out notifications to relevant professionals who purchase credits in order to submit competitive quotes. Up to 5 quotes will be accepted per project, and then it is up to the customer to make a decision and reach out (or not) to the pros who successfully get their quote in the hopper fast enough. For the prospective customer – they receive quickly customized quotes to compare pricing, read reviews, and hire a professional on the spot. 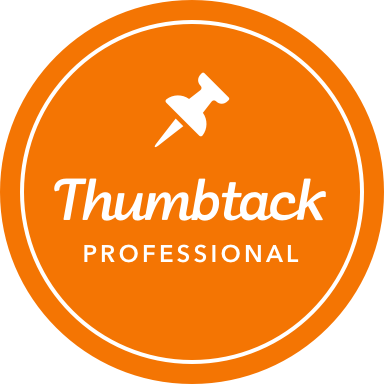 Creative by Clark is now a registered Thumbtack Professional. We pass on a lot of projects that reach our inbox, as budgets are either too low or information is way to vague for us to provide an accurate quote. But we’re keeping our options open, too, and we will continue to consider this as a possible way to extend our market reach.